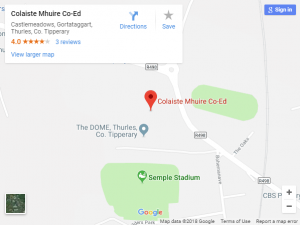 We in Coláiste Mhure Co-Ed endeavour to provide good quality and good value courses to the people of Thurles and the surrounding areas. The programme of Adult Education classes is wide and varied, offering courses to suit the needs and interests of the whole community. We offer a wide range of courses for personal development, professoinal courses certified by FETAC and Hobby and Craft courses. These courses provide educational opportunites and a social setting where you can to get to know new people with similar interests. In Coláiste Mhuire we have a proud tradition in delivering quality night class programmes and we try to ensure they are inclusive and available to the local community. There are two terms of Adult Education Classes each year, one in Autumn, beginning the end of September, and a second in Spring beginning the end of January. All classes will run on Monday and Thursday nights. Enrolment will take place at the beginning of each night class term. Please enquire at the office for dates and times.